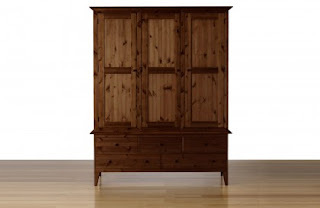 The wardrobe was something we bought as part of a costly splurge on expensive bedroom furniture about four years ago. Sadly when it arrived at the new house there was no way it was going to fit up the stairs so it spent the first few days in a downstairs room. Then I had a brainwave and thought I'd reveal my scheme to the Missus. My idea is greeted with silence and a look that suggests I've just asked her to let me sleep with her best friend while she makes us a finger buffet for afters. I rack my brain then remember the words my Mother uttered to the first girlfriend I brought back from college in a bid to impress her. Then a day later I try to hang a picture using dodgy hooks and it falls off the wall and smashes the frame and the triumph of wardrobegate is all but a distant memory.